It comes down to this: the next couple of months. Lately Northern California has captured national headlines with fast-moving blazes such the Rocky and Jerusalem Fires in the coast ranges about 100 miles north of San Francisco. 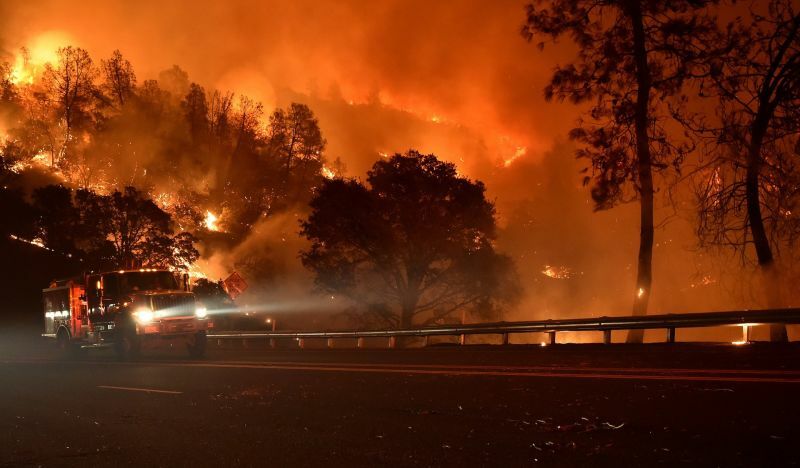 Unlike many epic fires in the California record, which were largely driven by wind, in the fires burning north of the Bay Area, "There really is no signifcant wind," says Cal Fire Director Ken Pimlott. "It's all being driven by the condition of the vegetation." Which is to say, not merely dry, but four-year-drought dry. Pimlott says Cal Fire measures the potential burn intensity of vegetation throughout the state, and is currently seeing "record levels" of that metric, known as the Energy Release Component. "It's just creating explosive growth rates," he says. The Jerusalem Fire went from 100 to 5,000 acres almost overnight. But the worst may be yet to come. As summer gives way to fall, the winds typically shift and dry winds from the east sweep across California, turning an already sizzling fire season into a potential blast furnace. "As we get into late summer and early fall, not only are we still seeing the potential for extreme fire behavior in Northern California, and the potential for a large number of fires like we're seeing now," says Pimlott, but "we also get into that peak window for Southern California with Santa Ana winds." Similar winds known as Diablos kick up in the northern part of the state. "And so the state, literally, is really primed right now to have multiple fires going on, north to south." In this interview with KQED, Pimlott talks about fire behavior, busting budgets, boots on the ground, and his confidence in the state's ability to confront an ever-expanding fire season.